Rather than joy and excitement, the unearthing of what an academic called "a Byzantine Pompeii" at the heart of modern day Thessaloniki, Greece's second city, has caused bitter controversy in a country clutching at economic straws. Instead of sealing off the ruins, the backers of a key rail project being built at the same site are threatening to have them removed within weeks. 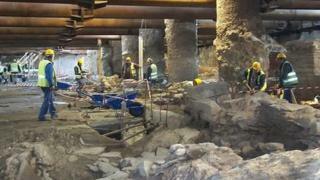 Six metres below ground, archaeologists found what they say exceeded even their wildest dreams: the commercial heart of the ancient city below the commercial heart of the modern one - marked by a crossroads built by Caesar Galerius in the 4th Century and reconstructed two centuries later, when Thessaloniki had become the second city not of a nation-state, but of the multinational Byzantine Empire. Descending the staircase to reach the closed-to-the-public dig site, you can see an incredibly well-preserved marble-paved road, complete with the remains of what used to be shops, workshops and public buildings and spaces. The road is still visibly etched by the passing of carriages, while the accompanying archaeologist even points to a marble block showing the markings of a noughts-and-crosses game, presumably carved by children playing in the open air market 17 centuries earlier. Archaeologists and city authorities dream of a metro station combined with a subterranean museum, that will become a major tourist attraction and a constant reminder of the city's glorious past - a past lamentably hidden today by decades of anarchical construction and disastrous city planning. Engineers with the company implementing the metro project, Attic Metro SA, however, say the two cannot exist together. Keeping the ruins would mean scrapping the central subway station - and jeopardising the entire 3.5bn-euro (£3bn) EU-co-financed project - one of the few major public works under way in Greece's moribund economy. It is scheduled to be complete in 2016, missing the initial target by at least four years. The main 9.6km (six-mile) line is meant to transport 250,000 passengers daily, decreasing traffic congestion and air pollution. Attiko Metro SA is armed with a decision by Greece's Central Archaeological Council, authorising the transfer of the finds to another area. But removing a road complex from its original position is considered by some archaeologists to be tantamount to destroying it. "Moving it would be catastrophic. A road is not a portable monument. It would lose all reason for being," the director of the Thessaloniki Archaeological Museum, Polyxeni Veleni, told the BBC. Stratos Simopoulos, Greece's secretary general for public works, says there is no alternative. "We realise how important the find is, but it is impossible to keep it there. Everything else is hot air. I respect the archaeologists, but I ask them to respect our expertise as well", he told the BBC. Mr Simopoulos adds that he is determined to follow the archaeological council decision and remove the road. "The debate can go on for some weeks, but if a practical alternative is not found by then, we are not willing to wait forever. Politics is not only about consensus, but also about collisions," he said. About 450 workers demonstrated this week after being laid off, because the project is stalling. Any further delay would certainly mean more gloom for the area's shopkeepers, already suffering not only from the country-wide recession, but also from the barricades and noise driving customers away. Mauricio Serra, an Italian who moved to the city in 2004, owns an optics shop at Venizelos Street, a few metres from the main dig site. He is visibly agitated when asked about the issue. "We have been plunged into financial trouble for six years already. The project must be completed as soon as possible," he told the BBC. Despina Makropoulou, the head of the Ninth Ephorate of Byzantine Antiquities and of the excavation, insists it would be a crime to remove the antiquities. "It is self-evident that we should preserve and showcase the finds for current and future generations," she says. According to her, this makes even financial sense. "In Greece, we are not in the business of making cars," she told the BBC at her office, housed in the courtyard of the magnificent 306 AD Rotunda of Galerius. "Our heavy industry is culture, the heritage of our ancestors. We must be proud, but also worthy of this heritage." Thessaloniki Mayor Yiannis Boutaris sounds remarkably calm, and confident that human ingenuity will solve the dilemma. "In our age, nothing is technically impossible," he said. "And not everything can be measured by money or time. The city needs the subway, but it also needs its heritage." The City Council, despite having no official say in the matter, will vote on a resolution requesting that the Central Archaeological Council rescinds its decision to remove the finds. The mayor is confident that the scientists at the city's Aristotle University and Technical Chamber will come up with a solution that has escaped the subway project engineers. The fate of a road walked by Roman soldiers, Byzantine merchants and Christian saints, hangs in the balance.